Last week Kevin bought us all (except Cassie) new bikes. Well, new bikes to us, they are used bikes. He found them on Craig's List. He found some really great deals. The bikes are all made in the USA and are high quality bikes. He bought all 3 for less than we could have bought one of our bikes new. AWESOME!!! The whole idea behind getting new bikes was so we can take family bike rides together. Which is what we did this past weekend. 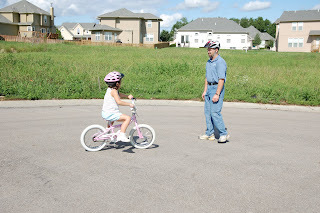 But first, we had to teach Aundrea how to ride without training wheels. We rode out to the end of our subdivision to a cul-da-sac that is lacking in houses. 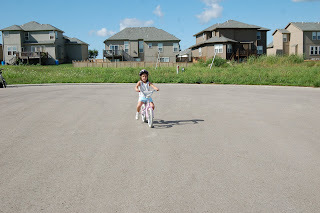 The street had a slight slope which is ideal for teaching her to ride a bike. Kevin did all the teaching. He was amazingly patient with Aundrea. He made her fell comfortable and safe. She was having fun!! She did it!! Can you tell she is balancing? I was so surprised at how fast she caught on. I was so happy for her. Cassie and I were jumping up and down cheering for her. She still needs practice and experience which will bring confidence. 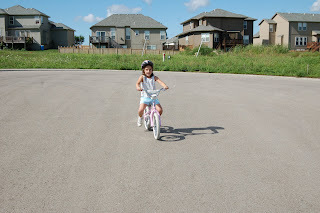 During our bike rides this past weekend she used her training wheels. Kevin moved them up so she would have to balance and she did and she was so excited. Oh, I forgot to tell you. Kevin is trying out for the Circus!!! He was just showing Aundrea something and being silly. Where does Cassie ride, you ask. She rides in a kid set on Kevin's bike and loves it. Well I'm off. I have chores to do. Later. 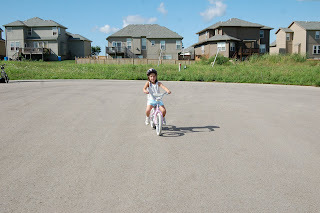 Congrats Aundrea on riding the bike without training wheels! You look like you have it down pat. 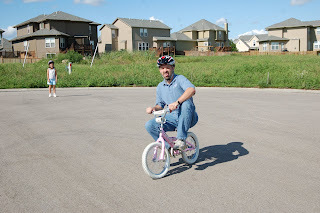 Ok, I had to relook at posts since there are no new ones and the picture of Kevin on the bike just cracks me up!